There was a point in time where someone decided the optimal interface to control your sprinkler timer was a 12 position knob and two buttons. I’m not sure what it’s optimal for, but it’s certainly not user experience. Perhaps it saved a nickel on the manufacturing costs. When I bought my house I wanted to drastically change the landscaping in both the front and the back. One of the things this meant was that I would get the opportunity to install the irrigation system however I liked. In the end of the day, I might have overdone it. When I started drawing out my irrigation system I wasn’t sure exactly how I was going control this many zones. I know they make 12 zone sprinkler controllers, but I’ve never liked working with them. I wanted something better. It turns out, I’m not alone. There are tons of people who have made projects to control sprinklers through code. Most of them are essentially relays hooked up to an Ardiuno or RaspberryPi. Some of them are even networked. While this is definitely heading in the right direction, I didn’t have the time to reinvent the wheel on this round. A little bit more searching lead me to the OpenSprinkler. This was extremely appealing to me as even their main product is just an Arduino with some custom software on it. I wanted something a little bit more flexible. And I really wanted to be able to write my code in Ruby. I love Ruby. What I really wanted was something based on the RaspberryPi. A few months after I first came across OpenSprinkler they launched OpenSprinkler Pi. It’s exactly what it sounds like. You provide a Raspberry Pi and they provide a daughter board that has 8 sprinkler zone outputs. 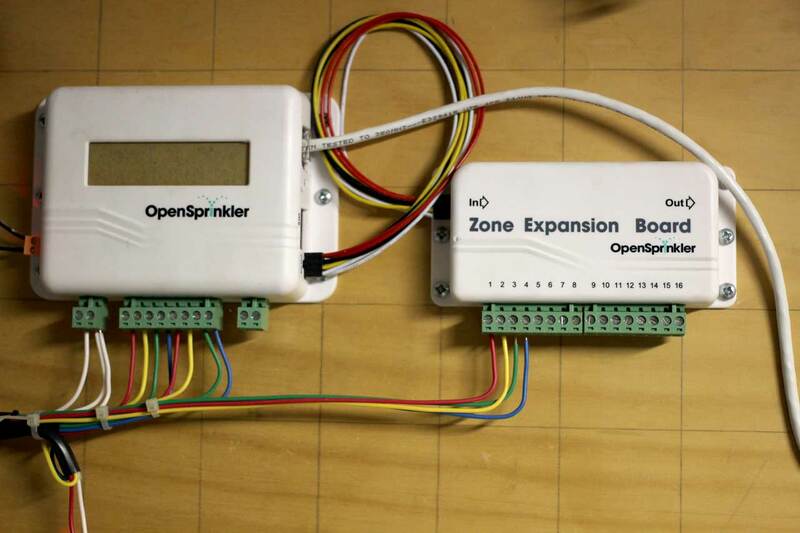 Since I have 11 zones, I needed to also purchase the OS Zone Expander which means I now have a whopping 24 outputs. There’s a Python port of the Arduino software that runs great on the OpenSprinkler Pi. And, they even have an iOS app. While it’s not Ruby, Python is not a terrible choice. I’m sure there will be a day when I want to add a feature or fix a bug, and when that day comes I’ll be glad I have the OpenSprinkler Pi on my wall.